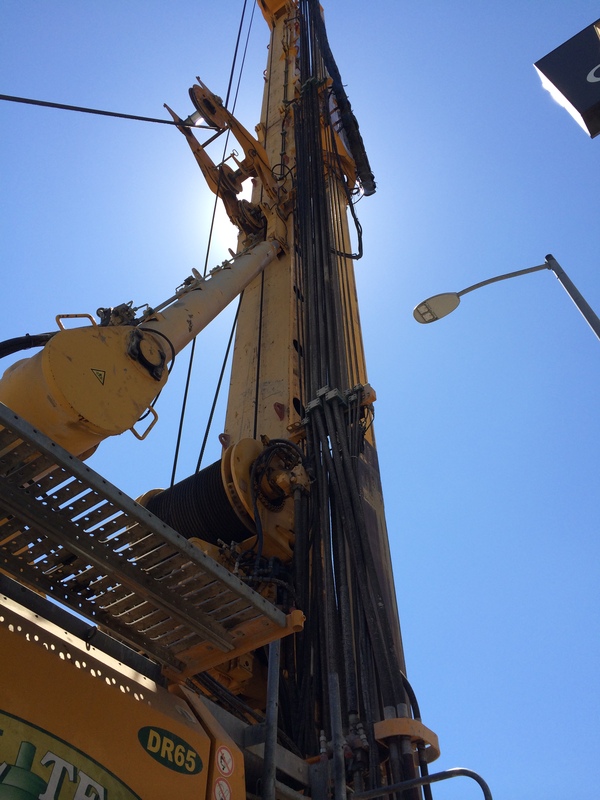 Drilling near the intersection of Crenshaw Boulevard & Exposition Boulevard. Photo by Metro. The 8.5-mile Crenshaw/LAX light rail project currently under construction will have three underground stations: Crenshaw/Exposition, Crenshaw/MLK and Crenshaw/Vernon. Excavation and decking for the stations is set to begin in November. Construction of the three stations and the 1.9-mile twin tunnels will take four years of intense and complex labor. In November 2014, Metro’s contractor Walsh Shea Corridor Contractors (WSCC) will begin to excavate the first underground station at Crenshaw/Exposition. Work is expected to begin the first week of November and will continue until Nov. 24. The contractor will not work during the Thanksgiving holiday and will resume work on Dec. 1 through Dec. 14. If it is necessary, the contractor may continue with more work in January, 2015. For now, Crenshaw Boulevard between Exposition Boulevard and Rodeo Place is experiencing closures from 9 p.m. to 6 a.m. to finish the storm drain, protect utilities, and to place steel piles in order to finish the underground perimeter wall before major excavation begins. There will, however, be a full 14-day closure in order for the four perimeter walls to be constructed. This closure will be on Rodeo Road at the intersection with Crenshaw Boulevard. The closure will begin at 9 p.m. Friday, Oct. 24, and run through Friday, Nov. 7. It will take approximately two weeks to complete the perimeter walls in this segment. Work will be conducted around-the-clock. This will then be followed by major excavation. The work for this underground station is taking place on the west side of Crenshaw Boulevard between Martin Luther King Jr. Boulevard and Stocker Street, where the contractor continues prep work before cutting mix soil and steel piling process begins. Traffic reconfiguration and setting up K-rail has taken place already and piling installation is expected to soon begin. Expo Line and Crenshaw Line so close to one another yet so far away. To bad the MTA does not understand the concept of inter-connecting different lines which could result in alternate routes. Expo Line from Downtown L. A. to Crenshaw Line to the airport. What a novel idea, one seat from Downtown to LAX. Any such line in the future will be yet another line probably redundant of both the Expo Line and Crenshaw like were seeing Downtown with the Connector and the Red Line from Seventh and Flower to Union Station. Mike, a one seat ride from LAX to DT would require reduced frequency on the Metro Blue and Expo Lines, which will carry a minimum of 154,000 daily riders. The Crenshaw Line will have carry 20,000 daily riders. If you want to be an engineer go to engineering school. Gee I guess they were using magic to maintain the high level of service on the L.A.Railway where more than two lines used both Broadway and Seventh St. Then there was the P.E. that ran hundreds of trains out of the Main St. Station everyday. And lets not forget P.E. service out of the Subway Terminal that ran at least four different lines out of there which in fact improved headways. Why underground stations for light rail? Do they connect with subway? The train is going under a part of Crenshaw Boulevard that is wide but very busy and then a portion of the boulevard that is far narrower. The Crenshaw Line could connect with the Purple Line except there is no station planned at Crenshaw on the Purple Line. Mike, there doesn’t have to be a station at Crenshaw/Wilshire for the Crenshaw line to connect to the Purple Line. In fact, almost all the studies of extending the Crenshaw line have a route that goes north along Crenshaw, then west along Venice (and San Vicente), then north along either: La Brea, Fairfax, or even La Cienega/San Vicente. Either of these 3 places could easily connect to the Purple Line. Alternatively, you could just go up Crenshaw to Wilshire, then half a mile east to Wilshire/Western, another possible connection. Trains using third rail and overhead wire converge at Penn Station New York. Connect the same way the Blue Line and Red Line connect at Seventh and Flower. Yes a transfer but one that is convenient. It seems kind of strange that the MTA has owns two parcels of land on Wilshire at Crenshaw for many years yet now that construction is about to get underway no station is going to be built there. There’s a whole bunch of chatter that the Rams will be returning to LA and will take up residence in a new stadium to be built at Hollywood Park. The Rams’ owner just purchased a big chunk of the HP parking lot, so it’s not all that far fetched. You don’t plan and build a transit system based on hypothetical. But for arguments sakes, moving the train station closer to Hollywood Park will put it next to Inglewood Cemetery (the residents there don’t take transit very much!) which is kind of missing the point. If Rams does return, it will be easy to add a shuttle bus to Hollywood Park. I don’t follow Inglewood that closely, but the council seems obsessed with extending the Century / Crenshaw national chain store morass west to Prairie and shafting their old downtown. A high frequency transit loop from Florence / LaBrea through the above area south to the Green Line and back up Hawthorne Blvd could help revitalize the city. When do the tunnel boring machines (TBM) arrive? Exciting! It is currently on a boat! We expect it to get here by the end of the year, and will update when it arrives. It doesn’t take an engineer to know it takes a 1-seat ride to get commuters out of 1-seat cars. The real reason for the Downtown Connector is because there is a bottleneck in the Seventh and Flower station due to it not being designed for two separate lines with different headway’s. With the Connector a holding track should be constructed so as some trains can originate at Seventh and Flower. This whole idea of each line being completely independent of one another is foolish and costly. The last five former L. A. Railway (LATL) rail lines ran out of one division where the Convention Center now stands. Both Seventh St. and Broadway had multiple lines on them. The same was true for the Pacific Electric. And where precisely is the money going to come from with all the ideas that are being thrown out here? Sure, everyone wants an one seat ride from LAX to DTLA. All you need to do is have boat load of money that grows on trees, buy out every single property that exists between LAX and DTLA that’s in the way of this development, or have a really fast and efficient boring tunnel that dig a straight line tunnel between LAX and DTLA in less than a year. It’s easy. All we need is $10 trillion dollars that comes out of thin air, doesn’t come from taxes, and that doesn’t have to be repaid by our children and our grandchildren’s generation. And everyone should just listen to big brother government and let them do what they want to do because government knows whats best for us. And everyone should work 24 hours a day 7 days a week with slave labor wages, disregard all safety concerns for the workers so as to construct that line into operations as quickly as possible. We should go so far as to disregard every environmental regulations, get rid of the Fifth Amendment from the US Constitution because government shouldn’t have to pay the people who own property, and crush any NIMBY dissent and opposition to these plans. If you want that, go vote for the Communist Party of the USA. That how China does everything so fast. It’s done everyday in Europe and other countries that promote public transit and intercity rail as the safest and most environmentally-friendly way to travel. The U.S. could use a tiny fraction of money wasted on war and bailing out corporate crooks to build that smart connection in LA. It’s called a turn-outs at places like Imperial Station(Blue Line to Green Line to almost LAX) or Expo Line to Crenshaw Line to almost LAX. But of course they put the two rail lines at Crenshaw and Exposition of different levels. But at Imperial station there is a ramp from the Blue Line to the Green Line that was used before the Green Line equipment arrived. One thing to keep in mind: getting from Expo to Crenshaw only involves crossing 1.5 lanes of W. Exposition Boulevard — not all of Lankershim Boulevard as is the case between the Red Line-Orange Line. Furthermore, this is just a stub of Exposition Boulevard. The main traffic on that street runs to the north of the Expo Line. New York MTA has several ped tunnels between stations or major parts of stations. The Port Authority-Times Square Passageway is the longest one I think. http://www.youtube.com/watch?v=HE30k1pXxvw It is great to use when it is raining outside. Los Angeles has many tunnels built under the street near schools. They all smelled terrible as I remember and are now locked up because they were a haven for crime. Hauling suitcases across streets and light rail tracks will be off-putting to air travelers connecting between the Crenshaw and Expo lines. It could be a laughing-stock point on the Tripadvisor website, that not only does LA’s airport line not go downtown, but it must be the only city in the world where air travelers must cross busy urban streets and rail tracks, sometimes in the dark or rain, to get between the airport and downtown lines. There are no images or designs of the station on the web. Is Metro trying to hide something, that there will not be a pedestrian subway connection between the lines ? Surely at this stage of construction is the cheapest time to add such facilities, which would be considered necessities in almost all other cities. No one is trying to hide anything. There is a rendering in the project’s final environmental document on page 2-39 (sorry, wordpress doesn’t allow me to post images into the comments). The portal to the Crenshaw/LAX Line is south of Exposition because there isn’t room for a portal in between the tracks. As I explained earlier, the main part of Exposition Boulevard that carries both east and west traffic is north of the traffics. The portal to the Crenshaw/LAX Line is south of the tracks, requiring pedestrians only to cross 1.5 lanes of W. Exposition that Boulevard that is not as heavily trafficked. Hope that helps. Its embarrassing / bizarre that two key rail lines, that have been in the works basically over the same timeline (last decade or so) did not have a more convenient, efficient connection designed into their construction plans BEFORE they were built. This is done all over the world. Its not like the expo line phase 1 was built 30 years ago…its like 2 years old. The Expo planners knew the Crenshaw line was coming, it was just a question of a below or above grade transfer point (and below grade was the most likely because of the possible Northern extension to Wilshire). Why not design the Expo so stairs/elevators could be installed for either grade scenario of the Crenshaw line? Its not like Exposition Blvd would have been adversely affected by this change (the whole Blvd was re-designed anyway so what’s one more change). Commuters and tourist are going to be using this transfer point for decades…what were the planners thinking? Citing budgetary restrictions is NOT a valid argument as to why a more convenient connection was not designed into the Expo line . Its amazing what happens when Politicians want something added to a train line. The nearly “bankrupt” city of LA magically finds/moves money around to help fund things like, an Underground station in Leimert Park, a bridge over Sepulveda Blvd, add the poorly conceived USC station, etc. Don’t get me wrong, these items should have been in the project from the beginning, but don’t say the MTA/City of LA doesn’t have the money for it…they can find the money and the will when they want to. I totally understand where you’re coming from. But some background that may help explain the decision regarding the junction. The Crenshaw Line as originally envisioned continued north on Crenshaw Boulevard to a likely junction with the Purple Line Extension and then perhaps beyond. With only so much Measure R money available, Metro decided to build the line between the Expo Line and the Green Line the idea being that such a line would serve the Crenshaw business district and get the rail line near LAX and also allow transfers to two existing rail lines, the Green and Expo. A northern extension of the line remains in Metro’s long range plan as an unfunded project. If built, such a northern extension would likely remain underground — so at this point bringing the line to the surface at the Expo Line could make such a future project more difficult. Interestingly, there was talk of having the Crenshaw/LAX Line run at street level north of MLK Boulevard. But the city of Los Angeles and the then-CRA, as I understand it, requested that the line be put underground in that segment because of traffic and potential future projects. Even with a surface rail line, it was unlikely that there would be a link between the Crenshaw and Expo Lines because of the planned frequency of service along the Expo Line — it would be hard to keep merging trains at that junction and then keep the Blue/Expo junction at Washington/Flower manageable. Probably more info that you needed. Hope that makes sense. To Sad: I agree. Only in America. There are few smart rail or intermodal connections in the US. Why doesn’t the Blue Line direct connect to LAUPT? In the end most travelers will continue to use cars, busses, cabs, Super Shuttle, and hotel vans to get to airport. Even if there were a smart connection between Crenshaw and Expo or a one seat ride to LAX ….light rail in LA is way too slow . Perhaps the planners need to make a visit to the MTA library. Many photos and discriptions of our great former transit system including one train right behind another on places like Broadway and on Seventh St. This idea that a third line can not be created where the Crenshaw Line and Expo Line meet due to the mixed headways of the Blue Line and the Expo Line from the Seventh and Flower Station. The streetcar system was certainly extensive and a great aid to mobility in our region. But it wasn’t terribly fast and it was prone to conflicts with cars where the streetcars ran in the streets. It’s too bad some of the lines weren’t immediately renovated and improved instead of being shut down. But it’s also important to recognize that streetcars weren’t perfect either. I don’t know Steve but 35 minutes from Downtown L.A. to Long Beach seems pretty good to me. But my point was trains need not have huge gaps to be safe or on time. Just last year I observed one Expo train after another northbound on Flower due to a break down I was told by a operator I knew. Apparently no one tried to use a turn out and single track the trains around the breakdown. And I’m guessing deadheading to place a train on time is out of the question.